After six years of neglect by Sydney City Council, the faulty toilets in the Fitzroy Gardens will be replaced by three brand new toilets. This is a big win for everyone in the Kings Cross community. Thanks to all who contributed to this long struggle. The Save Fitzroy Gardens group will be watchiing closely to ensure the Council delivers on its promise. 1. The Friends of Fitzroy Gardens is a volunteer organisation. From time to time the commitment and enthusiasm of volunteers varies. Recently, after numerous complaints from members of the public, we commenced "soft" monitoring of the availability for public use of the toilets under the Police Station. We concentrated on Saturdays (most of the complaints from the public came in from patrons of those markets and particularly customers of the many food stalls). For a period of at least eight weeks on every Saturday (market day) beginning in August 2017, at least one, and on occasions all, of the toilets were inoperable. One of the Save Fitzroy Gardens supporters posted about these facts on Twitter and we were subsequently contacted by Sydney City Council's Councillor Craig Chung who offered to pursue the issue, determine the exact nature of the problem and look for a solution. Clr. Professor Kerryn Phelps AM and Clr. Christine Forster also offered their help. 2. At the suggestion of suggestion of Clr. Chung we set about carrying out daily inspections of the public toilets and meticulously recording our findings. Clr. Chung obtained documents under a Freedom of Information request and asked Questions on Notice about the Fitzroy Gardens toilets. 3. On Friday 29 September at 8pm No 3 toilet under the Police Station was out of order (see photo below). An issue report was submitted to the Council of Sydney (see photo below of confirmation page showing confirmation number OGB0262963). 4. On 11 December 2017 Councillor Craig Chung moved a motion in a Sydney City Council calling on the CEO of the City of Sydney to investigate the feasibility of replacing the existing toilets. This motion was voted down by the ruling #TeamCloverMoore councillors. Clr. Philip Thalis, one of the Clover Moore team, described the motion as "small minded". Broken again! No 3 toilet under the Kings Cross Police Station in Fitzroy Gardens. After we filed a report about the broken toilet, Council issued this confirmation notice. 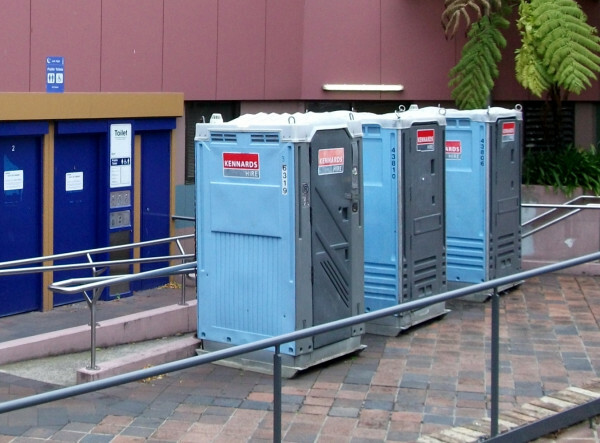 The Fitzroy Garden's toilets broke down on 24 April 2015 and portaloos were brought in as a temporary replacement. After protests in June by Friends of the Fitzroy Gardens and other concerned members of the community, the toilets were finally fixed in late June. 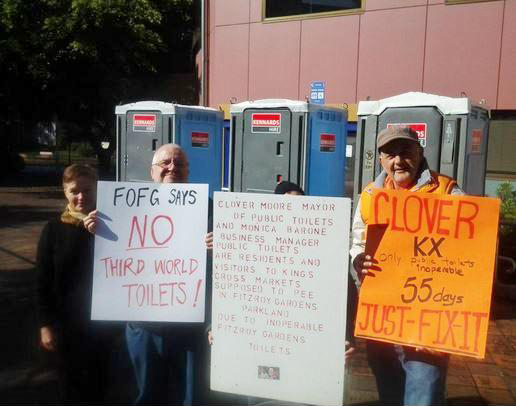 On 20 June 2015 a demonstration was held by members of the Friends of Fitzroy Gardens and other concerned residents asking Council to: JUST FIX THE TOILETS. Many local residents expressed their support of our action and their disgust that Council has not now fixed the toilets for 55 days. "Migrant's love of birds takes flight in the Fitzroy Gardens"
Despite a detailed written promise from Clover Moore's representative promising the new Playground would "complement" the colours and materials of the existing heritage-listed Fitzroy Gardens (click here to read the Lord Mayor's promise), the new playground we see being built in the Fitzroy Gardens features huge gawdy orange poles and totally unsympathetic colours and materials on all sides. 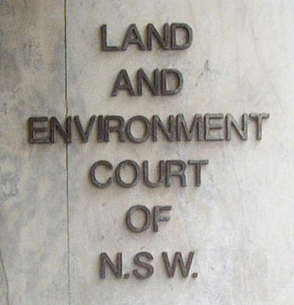 On 22 October 2013 the Woodhouse v City of Sydney Council case was heard in the Land and Environment Court of New South Wales. 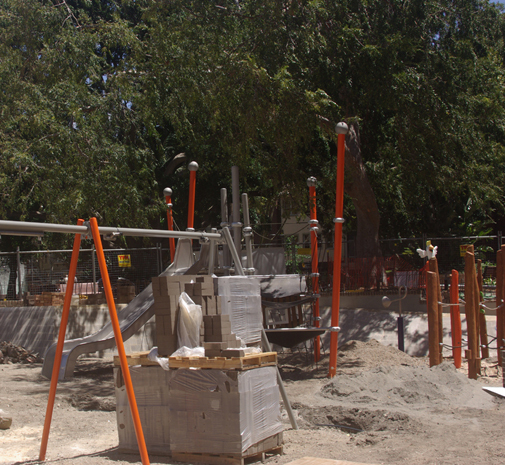 The Court found that Council needed a DA to do the proposed works in the Fitzroy Gardens Playground. This court verdict was a victory for due process and residential rights. For a full report on this court case, click here. On 9 April 2014 toilet number 3 was inoperable. Repairs took 9 days to complete. On 8 March 2014 all three toilets were out-of-order. Repairs completed on 14 March..
On 28 January 2014 toilet number 2 was out-of-order. This was promptly reported to Council. The toilet was back in operation on 30 January after just two days. The Council is improving its response time. On 2 January 2014 the toilets broke down. They were finally working again on 20 January -- after a period of 18 days out-of-order! 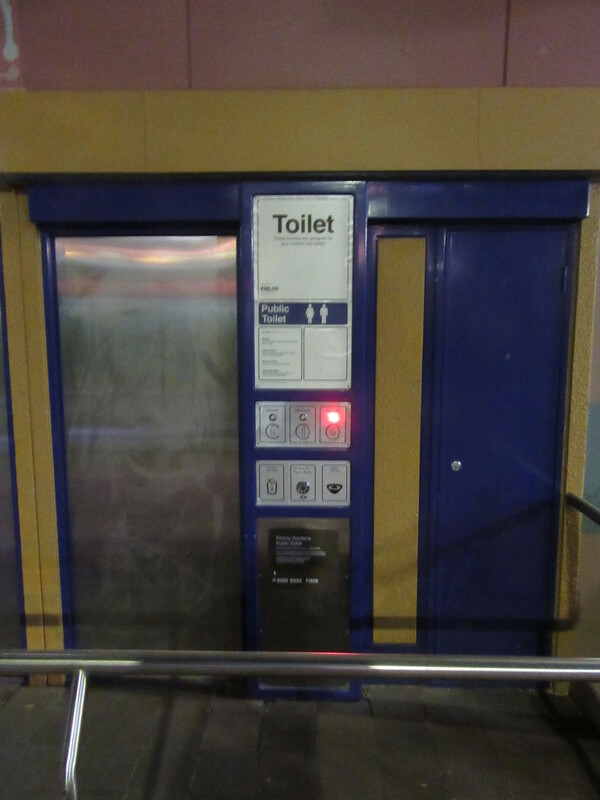 On 6 December 2013 at 7pm Fitzroy Gardens toilet number 3 was not working. Throughout December all three toilets were out of order on various occasions -- and for days at a time. On 30 December two of the toilets had signs on them advising people that the nearest public toilets were in Beare Park, Elizabeth Bay. On 27 October 2013 the toilets broke down again and remained so until 27 November 2013 -- a period of 31 days..
As of 14 October 2013 the Fitzroy Gardens toilets (the only permanent public toilets in Kings Cross) had been out-of-order again since at least 28 August 2013 -- a period of 48 days. The toilets became inoperable in August 2013 and this was reported at the time to Council (and a reference number received for the report). The Council put in place a row of smelly and ugly portaloos. The Friends of Fitzroy Gardens made a second report (and received another reference number). The toilets were finally repaired on 15 October and the portaloos removed by 17 October -- after a period of 48 days! Photo showing the extent of the works in the northern terrace of the Fitzroy Gardens. Date: 27 August 2013. In the tender plans voted through in June 2013, Council revealed its intention to redevelop both the Fitzroy Gardens playground and the northern terrace area. Both areas were put into one contract which one of the tender documents referred to as the "Fitzroy Gardens Playground Upgrade". In the 19 August Council committee meeting, a Council officer announced that work had started on the northern terrace and that when that was completed, work on the playground would start. I understand this was to minimise disruption to the Gardens by having smaller sections fenced off at any one time. 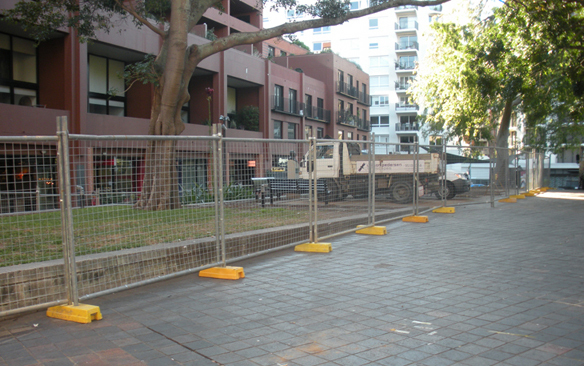 Work on the northern terrace began on Friday 16 August (see photo above where the whole terrace area from the Chinese elm tree to Macleay Street has been fenced off and is awaiting for plants to be removed and for the heavy equipment to arrive). Despite Council's claims of open government and transparency, it is difficult to say what Council really intends to do in the northern terrace area. The tender plans show a bigger staircase near the post office and a hexagonal garden to be installed in a place that differs from that shown on Ilmar Berzins's plans. One of our members viewed heavy equipment ripping out the northern terrace seating with no attempt to preserve it (with the wood and iron work cracking as it was removed from the ground). The future of the mosaic remains under threat despite 395 people signing our petition calling on Council to retain the artwork and the artists themselves saying they would be happy for it to be retained. Our letters to Council have met with evasive replies and we still do not know whether the mosaic will be retained or not. 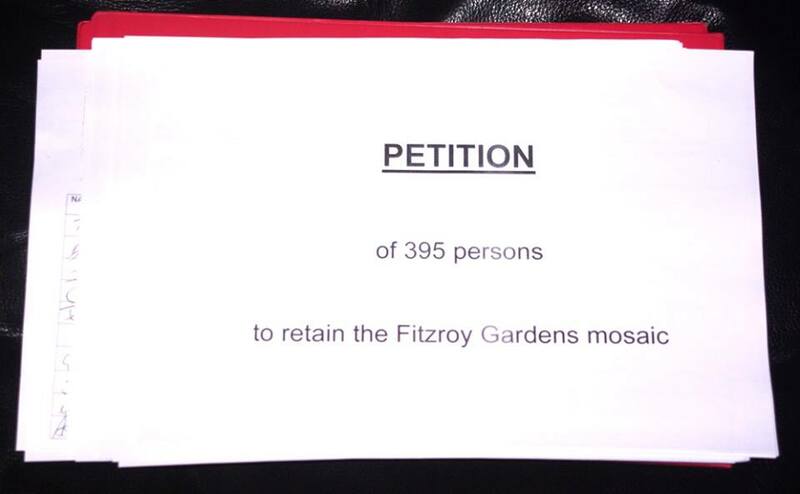 395 local residents say "Retain the Fitzroy Gardens Mosaic"! During the 29 July 2013 Sydney City Council meeting, Councillor Scott tabled a petition calling for the retention of the mosaic in the Fitzroy Gardens. It read as follows: "We the undersigned respectfully request the City of Sydney retain the Mosaic artwork by the artists Steven Vella and Lizzie Buckmaster Dove currently located on the playground wall of the heritage-listed Fitzroy Gardens. It is the first part of a 3-part public artwork created in 1997 that speaks about the local place, history and community values." This petition was signed by 395 persons. It shows the widespread support among local residents for the retention of the mosaic and for Fitzroy Gardens in general. The motion to approve the tender for Fitzroy Gardens was passed by Council on 24 June 2013. It was amended by Clr Scott (2nd by Clr Doutney) that staff attempt to preserve the Mosaic. When the amendment was proposed Clr Kemmis queried it - saying staff already said they would do that. Clr Scott replied that in that case, Kemmis would have no objection - and it was important to record it. Kemmis then accepted the amendment. The motion as amended, was put and passed 9-1. Clr Foster voted against it, saying it was an important matter of principle that, when elected representatives made a decision, staff should implement those decisions and not, of their own volition, implement a project which was 20% bigger than that approved by Councillors. There will be a Council committee meeting at Sydney Town Hall on Monday 17 June at 2pm during which one of the items will be the Fitzroy Gardens Playground project. Please come along and have your say (register with Council before 12 noon if you want to speak). What do the Playground Tender Plans show? We have obtained by a Freedom of Information request copies of Council's tender documents (plans, specifications, etc.) for the Fitzroy Gardens Playground Upgrade (click here to view). We have also received emails from Council stating the area of the new playground will be 317.5 square metres (almost 20% more than what was approved by Council in November 2012) and that the mosaic will not be retained.  Why is the Playground to be almost 20% bigger more than what Councillors approved?  Why is an African Tulip Tree being removed and apparently not being replaced?  Why does the "Playground Upgrade" actually include demolition works right through to Macleay Street (with almost one-third of the Gardens affected)?  Is it correct that one of the seating units is being lost in the upgrade?  Is Bulli terracotta paving being used on all new walkways, etc. to match the rest of the Gardens?  Why is the community-owned mosaic on the playground wall being trashed? Keep Community Art in the Gardens! We have written to Council asking for it to advise if the mosaic (see photo above) in the surrounding wall of the playground will be demolished or retained in situ as part of Council's alterations. The mosaic is an outstanding and expensive work and part of a triptych including both the Kings Cross Community and Information Centre entrance glass awning and its in-floor foyer mosaic. The central theme is the organic growth and positive nature of life. The exterior mosaic includes the words (in clockwise order) "Macleay St - Fountain - Elizabeth Bay House - The Strip - Fitzroy Gardens - Wayside Chapel" and relates to our local identity. It references heritage items and other landmarks the community considers significant. The mosaic triptych was installed by the former South Sydney City Council in 1997 and is part of the community's social fabric. The mosaics were created by well-known artists Steven Vella and Lizzie Buckmaster Dove in 1997. Steven described the three mosaics as "decorative door feature", "awning design" and "feature light". The mosaics were commissioned by the SSCC in the following circumstances. The Kings Cross Community Centre and the Library (originally the Florence Bartley Library) were to be located upstairs in the Rex Building, but the upstairs area was instead turned into meeting rooms. The Kings Cross Community Centre was located on the ground floor level, and it and the associated artworks (the mosaics) are community benefits that were part of the trade-off that the community were given in return for the Rex development going ahead. UPDATE: Both of the mosaic's artists, Steven Vella and Lizzie Buckmaster Dove, have emailed us to confirm that they are happy for the mosaic to be retained. But CEO Monica Barone claims that it is "not technically possible" to retain the mosaic (whereas the architect John Avigdor is on record that it certainly IS techically possible to retain it). Come on, Council! It is possible to retain the cherished mosaic. So JUST DO IT! On 28 October 2012, Council release a revised set of plans. Yes, the footprint would be smaller and the musical instruments would not go ahead, but the designs still had serious problems. This time Council gave the public just five days to review the plans before a vote was taken in Council's Environment Committee on 5 November that these plans be sent to a full Council meeting on 12 November. 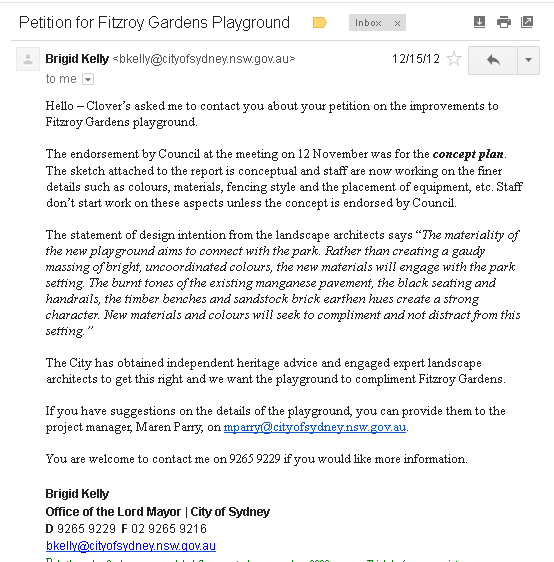 Despite just five business days elapsing since the release of these revised plans (with many unattractive new design elements) and almost zero community debate about them, the Environment Committee voted (with two dissenting votes, those of Clr Forster and Clr Vithoulkas) that the "refined concept design for the upgrade of the Fitzroy Gardens playground" proceed to a full Council meeting on 12 November. Council's first plans for a makeover of the Fitzroy Gardens Playground including an increase in the size of playground by almost four times, noisy musical instruments and a blocking of the traffic to and from the Gardens and shops. And of course Council was breaking its promise of May 2011 by these plans. The consultation period ended on 31 August 2012 with an overwhelming rejection by locals. In late July 2012 ugly black posts were placed around the beloved El Alamein Fountain, wrecking the whole vista. Heritage List ALL of the Fitzroy Gardens! Despite the Fitzroy Gardens and the El Alamein Fountain both being on the National Trust (NSW) heritage register, the Sydney City Council has only sent the Fountain (and not the Gardens) to the Heritage Council for listing. © 2011-18. Save Fitzroy Gardens. All Rights Reserved. This website is maintained by the Friends of Fitzroy Gardens and Lawrence Hargrave Reserve.